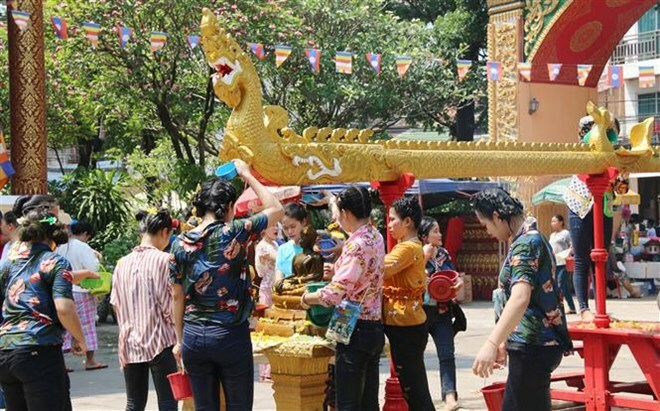 Vientiane (VNA) – People across Laos are celebrating their traditional New Year festival (Bunpimay) with a wide range of activities from April 14. In the morning of April 14, the first day of the festival, the streets in capital Vientiane were empty as all families performed the Buddha bathing ritual at home, followed by the splashing of flower-immersed water on each other to wipe out bad things and diseases while bringing in a clean and healthy new year. In the afternoon the same day, Laotians gathered at pagodas to participate in the Buddha bathing ritual and then tie colourful threads on each other’s wrists to wish for good health and luck in the new year. 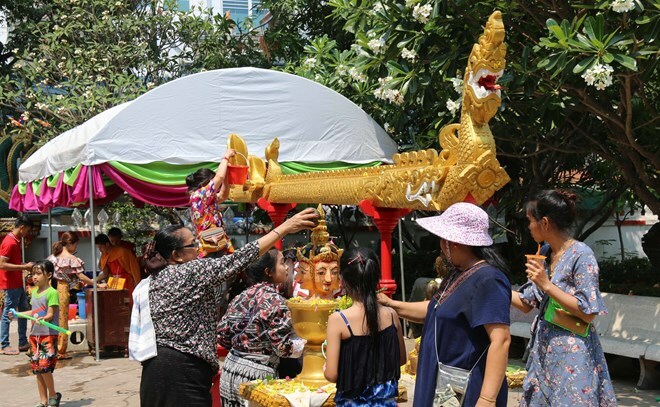 The highlight of Bunpimay celebration in Laos is the splashing of water, as the Lao people believe that water will wash away bad luck and diseases and bring vitality to everything. Tourists to Laos these days must not miss the Miss Lao New Year (Nang Sangkhane) procession, a traditional ritual of Laos that honours children’s gratitude to their parents. This year, the procession is organised in Luang Prabang to attract visitors.